Our experienced team members are on hand to help you find the best solution to your transport needs. Phone 01304228111 or REQUEST A QUOTE and we will respond ASAP. Any UK or European destination – we can offer you the most competitive in minibus hire. As Kent’s largest Mini Bus Company we pride ourselves on providing a safe, comfortable, and reliable Mini Bus hire service across Kent. For more info about us click here. Long distance or local. Email or call our experienced minibus hire team who are on hand to give expert advice. Getting married and need your guests transported to the venue? Going to the races? The Airport? Call us now to get a quote! and affordable it is to hire a Minibus from Britannia Coaches in Kent. Travel in Business Class with Britannia Coaches. Our clients include the UK’s top travel companies as well as a range of local and national businesses who rely choose us because they need a reliable, high quality and professional service. 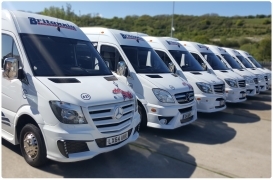 Britannia Coaches has the experience and capacity to meet all of your Minibus hire needs at extremely competitive rates. Whether you require a single mini bus or twenty. We are specialists at moving passengers and their luggage in comfort. We offer fixed price cruise transfers to and from the Port of Dover. Our vehicles are perfect for groups of Cruise Passengers requiring Transfers to or from Dover Cruise Terminal from all London Airports and London Hotels.We also offer excellent value sightseeing tours en route for just a few £’s extra! Click below for all the information you need to book your Dover Cruise Terminal Transfer. operator. With great rates on airport transfers, no extra charges for late night/early morning Airport Transfers. Just simple fixed prices and no hidden charges. Click below for cheap rates on Mini Bus Hire to and from all London Airports. Planning to go abroad this year ? Let us take you to and from the airport… We provide Airport Transfer Services to Heathrow, Stansted, Gatwick.. Luxury Airport Transfers To All Major UK Airports | Britannia Coaches britannia-coaches.co.uk	For private hire of minibus or mini coach for your airport transfer call Britannia Coaches. We have fixed prices, luxury mini buses and fantastic service. Christmas has come early and we’re all off to the company do at Wards Hotel, Folkestone. Look forward to seeing you all there!! Our telephone systems are down. We expect them to be back up and running soon but if you have any difficulty contacting us please use 07968570727..